Apologies :- Joe W., Armaan, Isaac Q. After a long summer with many doing different activities, youth councillors shared a piece of good news. 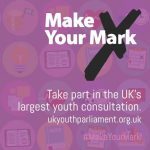 With Make Your Mark A Nationwide campaign, run by UK Youth parliament, that gathers information on what is important to the youth of the United Kingdom. coming in full swing, it’s time to get into schools and make sure every young person’s voice in the Oldham and the UK is heard. A few schools have already got involved in with the campaign but there are still a lot more schools to join. 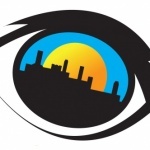 Work Experience :- Work experience has been worked on a lot, and a plan has come out on how to tackle this campaign and an email for schools and work experience centres. Mental Health :- Youth Council has commissioned the theatre piece Common Lore, with people wanting to see the piece. This is being shown to people in power, with youth councillors running workshops afterwords to accompany it. One other idea that came up with mental health is the idea of getting Young People and Old People to have a discussion with each other, share stories. Working with a scheme already being worked on in Oldham Library, young people could also be taught to use dementia boxes, so they can use them with old people who have dementia – could get Oasis involved. 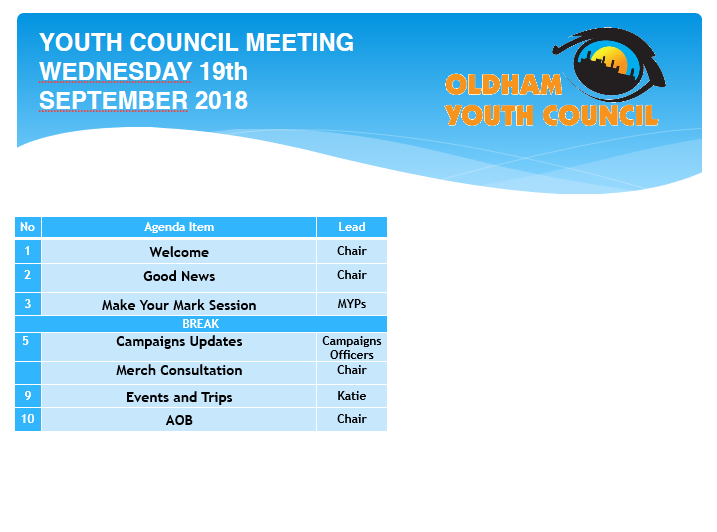 Youth councillors were given the opportunity to look through merch ideas for further campaigns and general OYC Oldham Youth Council merch. Events and trips were given out in the meeting.